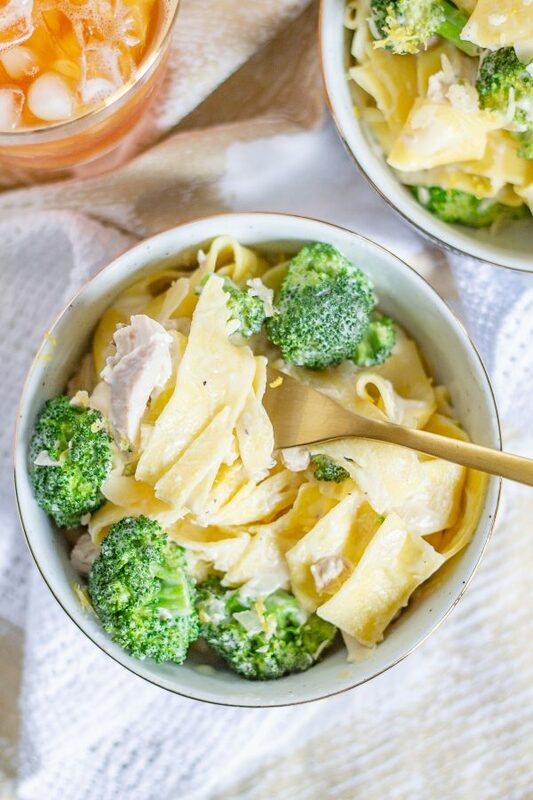 Chicken and Broccoli Pasta with a Goat Cheese Sauce is an easy dinner recipe that comes together in just 15 minutes. 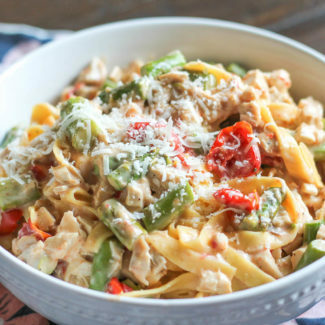 Transform leftover chicken into delicious homemade dinner. 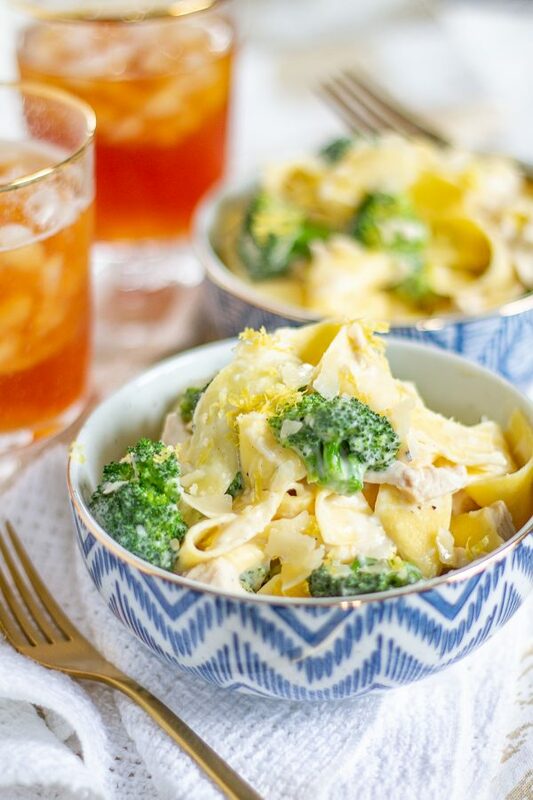 Chicken, pasta, and broccoli are coated with a creamy goat cheese sauce seasoned with fresh lemon juice. 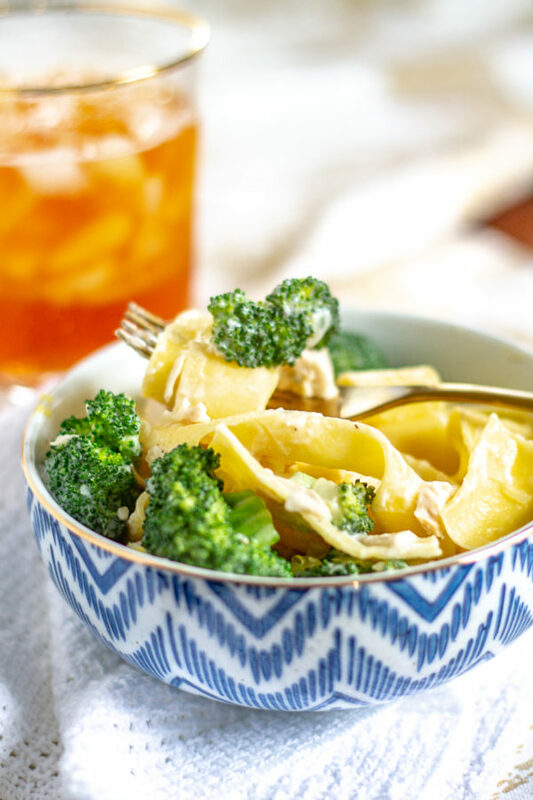 The way the broccoli florets soak up the sauce is one of my favorite parts of this meal. I have always loved broccoli, and it at its best when it is drowned in a cheesy sauce. I usually have leftover chicken in my fridge. 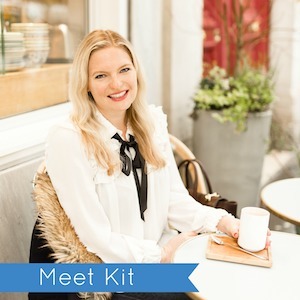 I make roast chicken and buy rotisserie chickens often, and I love the ease of making dinner when you already have some cooked chicken ready to go. 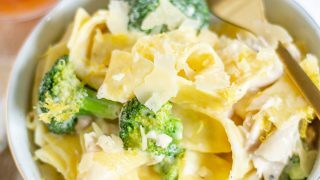 Adding chicken and broccoli to this pasta turns it into a complete meal. 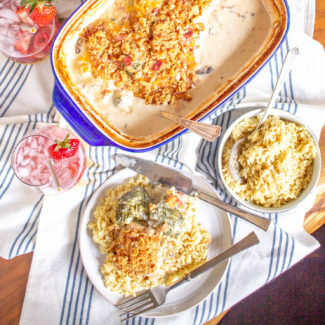 I love this recipe because it is rich and creamy, but the recipe is made without cream and just one tablespoon of butter. 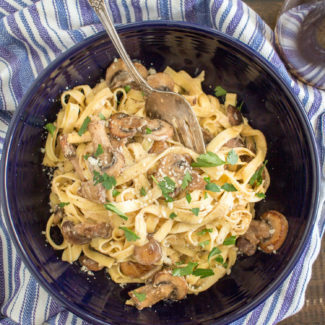 It’s a lightened up version of a creamy pasta. 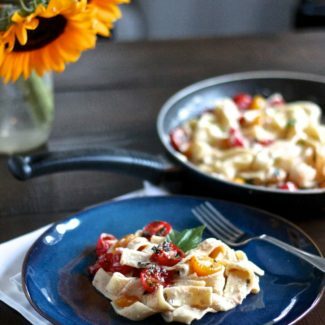 You can’t beat the taste of fresh pasta, and I was able to find Rana’s Pappardelle at my grocery store. The brand didn’t sponsor this post, but I am a genuine fan of their products and I think that it is the best fresh pasta that is widely available at grocery stores. The thick pappardelle holds the goat cheese sauce perfectly. The process of making this meal is easy. You put a pot of salted water on to boil for the pasta. While the water is coming to a boil and while the pasta is cooking, you prepare the sauce. The lemon goat cheese sauce is a simple sauce that comes together in just 10 minutes. I chop the broccoli into florets and I steam it in the microwave – it’s just the fastest and easiest way to do it. 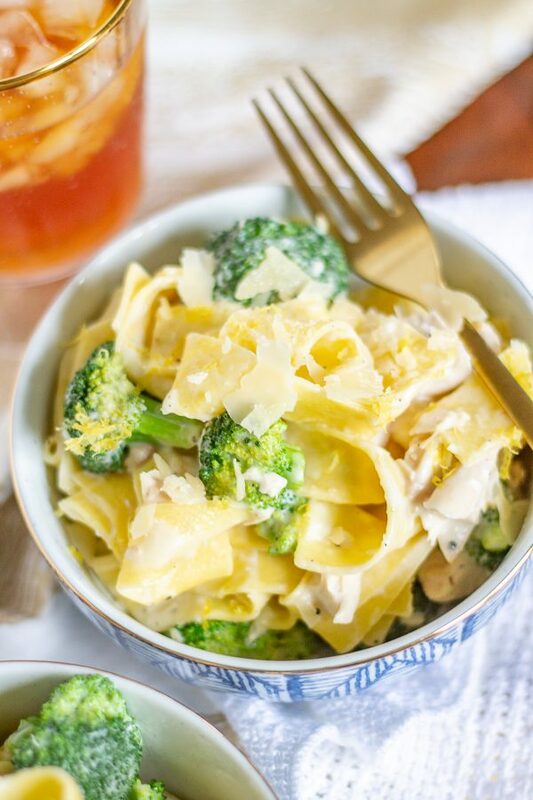 With the sauce ready and the pasta cooked, I combine everything and let the pasta, broccoli, and chicken cook together in the sauce for a minute or two before serving. 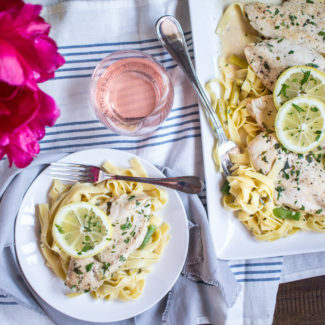 Transform leftover chicken into delicious homemade dinner. 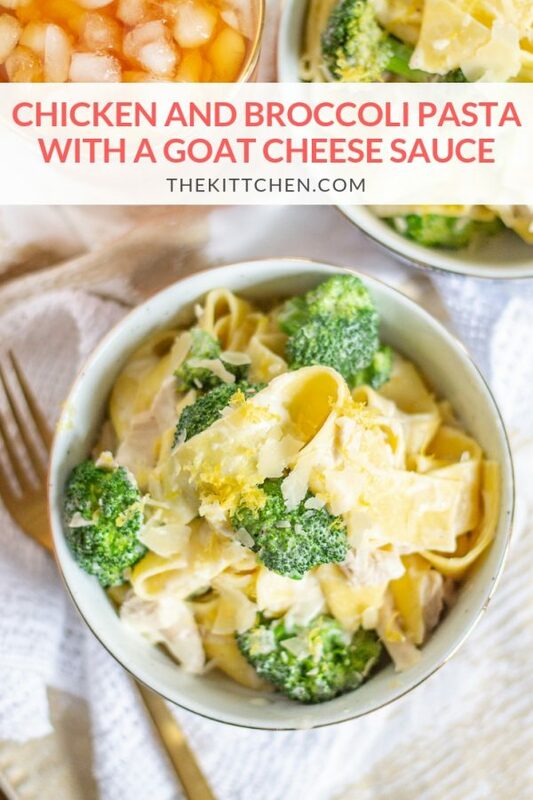 Chicken and Broccoli Pasta with a Goat Cheese Sauce is an easy dinner recipe that comes together in just 15 minutes. Put a pot of salted water on to boil for your pasta. Meanwhile, start on the sauce. Heat 1 tablespoon butter in a skillet or saucepan over medium heat. Add the white onion and sauté for 2 minutes, season with some salt and pepper. Then add the garlic and sauté for another minute. Next whisk in the flour, and let cook for 1 minute. Then whisk in the milk. Bring to a slow and steady bubble, and whisk constantly letting the mixture thicken for 1 minute. Then add the goat cheese and parmesan and whisk to combine. Stir the sauce until the cheese has melted. Whisk in the lemon juice, then stir in the chicken and keep warm over low heat. Rinse your broccoli with water - you need to get it wet so it will steam in the microwave. Then place the broccoli in a microwave safe bowl and microwave it for 1-2 minutes. Drain off any excess water and add the broccoli to the sauce. Cook the pasta according to the directions on its packaging. Once it is ready, remove 1/2 cup of the pasta water and stir it into the sauce. Drain the pasta, and add it to the sauce. Let everything cook together for 1 minute. 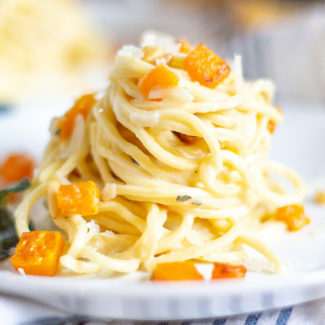 Then serve the pasta topped with a touch of lemon zest.